To earn a Gold Arrow Point to wear beneath his Wolf badge, the boy must complete any ten elective projects of the more than one hundred choices shown in the book. If he does ten more, he qualifies for a Silver Arrow Point to wear beneath the Gold. Multiple Silver Arrow Points may be earned, but only one Gold along the Wolf trail. 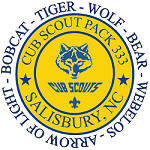 The Arrow Points are presented at the pack meeting after he receives his Wolf badge. The Gold Arrow Point is worn 3/4" below and centered under the Wolf rank badge. Silver Arrow Points are worn in rows of two below, centered, and touching the Gold Arrow Point or previously earned Silver Arrow Points for the Wolf rank. These are the requirements as they appear in the 2003 edition of the Wolf Handbook (33450). b. Start with a recipe card holder. d. Make and use a bench fork. e. Make a door stop. f. Or make something else. g, h, i. Make or put together some kind of model boat, airplane, train, or car. that interest you (for example, history, science fiction, how-to-books). cover for it or another book. in the space below (on page 166). e. Learn and sing a song that would be sung as a grace before meals. Write the words in the space below (on page 166). that is behaving strangely. Tell what you should do if you find a dead animal. way. Know where and how to shut off water, electricity, gas, or oil. d. Help plan and lay out an obstacle race. herringbone. Show the snowplow or stem turn, and how to get up from a fall. a. Visit a business where computers are used. Find out what the computers do.